Finally the time has come! Soon you can come pick up your Dalmatian puppy. Then, the moment comes where we, as breeders, have to transfer the responsibility of the care and upbringing of your puppy to you. After about 8 weeks, our little rascals leave the nest and go to their new owners. In the meantime, you are welcome to pay them a visit and to meet the mother dog. Perhaps you’ve already indicated a preference for a particular puppy in the nest. Will it be a male of a female puppy? section: a male or a female dog?. During the waiting period, you will probably have many questions about how to raise the puppy, but also about the care and the proper food. When you come pick up your puppy, you will of course receive a puppy package. In this package you can find things as puppy food and toys, but also an extended kennel folder with information about nutrition, upbringing and care of your Dalmatian puppy. The following sections will provide you with the first answers to your questions. 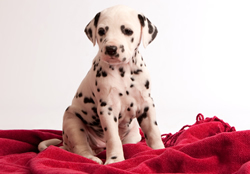 The upbringing of your Dalmatian puppy already starts with us, the breeder. With us, your puppy will come into contact with all kinds of noises and situations in order to ensure proper socialisation. This time at the breeder is very important. Over hondenvoeding zijn inmiddels boeken vol geschreven. Iedere fokker heeft zijn eigen voedingschema en iedere fabrikant zijn eigen voerlijn, schema’s en verschillende producten. Bovendien weet ook iedere dierenwinkel u nog eens precies te vertellen wat u moet kopen om uw pup zo gezond mogelijk te houden. Daarnaast bemoeit de dierenarts zich meestal ook nog met het voer van uw pup. Proper care for your Dalmatian puppy obviously starts with giving him sufficient attention. In addition, good physical care and offering varied activities are part of the care for your puppy. A Dalmatian is a naturally adventurous dog and will love to learn and discover new things. Make sure you do a lot together with your dog. This will strengthen the bond with your puppy, which makes it easier to make him obedient.